WildAid Hong Kong | China’s One-Year Ban on African Ivory Carving Imports: What Does it Mean? 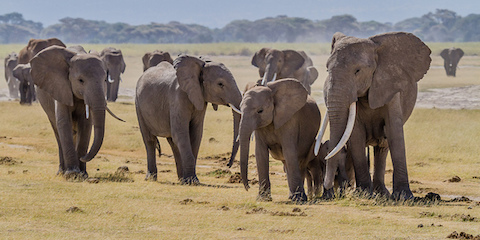 On Thursday, the Chinese governmental agency that oversees the nation’s wildlife trade announced a one-year ban on African ivory carving imports, effective immediately. Though the brief statement was posted online without fanfare, it sparked a global conversation as to what it means and how it could impact the ivory trade. Research has led to the decision that from this day effective until Feb 26, 2016, China will ban imports of African ivory carvings acquired after CITES [the Convention on International Trade in Endangered Species of Wild Fauna and Flora] took effect. During this period the State Forestry Administration will not handle any import request permits. For one year, individuals are restricted from bringing African ivory carvings bought for personal, non-commercial purposes into mainland China. The announcement applies to ivory acquired after 1989, when CITES approved a worldwide ban on commercial ivory imports. • Individuals returning to China from African countries such as Namibia or Zimbabwe who seek permits to bring ivory carvings acquired for personal use (i.e. not for resale) into the country. • Individuals who are seeking to bring a small number of ivory carvings into China without CITES export permits from non-African nations — primarily the United States, Canada, the European Union and the United Kingdom. Although these two groups represent a very small percentage of ivory consumers, the purpose of the notice is to clearly warn the general public that it’s forbidden to bring any ivory carvings into China. Thursday’s announcement is not going to end the ivory crisis, but it’s a small step in the right direction. A ban on the domestic sale of ivory in China is the greatest single step that could be taken for elephants, and that’s what WildAid encourages. • April 2014: The Chinese government strengthened a law on wildlife consumption by mandating jail sentences for eating or buying products made from the 420 species considered rare or endangered. • January 2014: The Chinese government crushed 6.1 tons of confiscated ivory carvings and tusks. In addition, the Chinese government has provided up to $200 million in donated broadcast air time and media placement each year since 2008 for WildAid’s wildlife conservation messages, constituting the largest wildlife conservation awareness campaign ever. With this extensive media distribution encompassing over 50 major outlets, WildAid messages on ivory, rhino horn, shark fin and tigers are resulting in significant increases in public awareness, changing attitudes and behavior, and reduced demand for wildlife products such as the recent decline in consumption of shark fin soup. We hope that China’s move to close this personal use loophole on ivory carvings is a sign of bigger things to come, and we congratulate the nation’s State Forestry Administration for its leadership.